The French-Swiss composer Pierre Wissmer never stopped travelling through music, be it modern, neoclassical or contemporary. Initially showing diverse influences (César Franck, Daniel Lesur), his style developed into a completely unique sound universe distinguished by graceful purpose and force of character, much like the migrating monarch butterflies. Spanning a 35 year period, the piano and chamber music works presented in this CD offer you the discovery of heretofore unknown musical spheres. 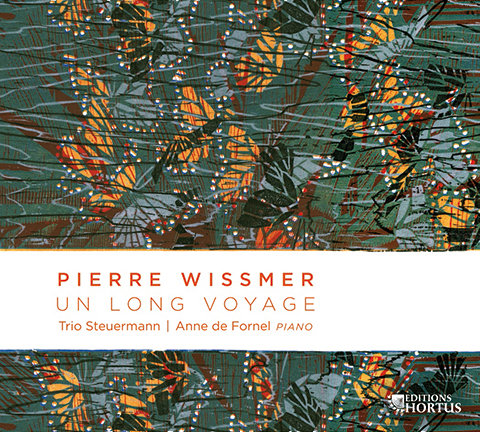 Throughout his life Pierre Wissmer’s trips between two homelands – France and Switzerland – nourished his musical imagination. In this wood engraving entitled ‘Long Voyage’ (2001), the American artist Jean Lodge captures the swirling movement of the butterflies enhanced by the natural vein of the wood, calling to mind their annual migration to a wintering site in Mexico four thousand kilometers from North America. As Wissmer said: One must compose with ‘the intuition of a water diviner’ and know how to find a state of equilibrium when the long voyage has come to an end. Such is the case of the millions of butterflies which, from one generation to another, succeed in alighting on the same tree in the forest of Michoacán.